Servicing and recharging procedures of kitchen hood and duct extinguishing systems per NFPA 96, 17 and 17A and IFC, ICC. FPC's Commercial Kitchen Fire System Servicing seminar meets the requirements of NFPA 17, 17A, and 96, and IFC pertaining to the service and maintenance of commercial cooking facilities, hood, duct and appliance fire suppression systems. The NFPA defines a trained person as one who has undergone the instructions necessary to perform maintenance and recharge reliably. The seminar also covers training and testing in one day. The testing includes questions on the subjects covered as well as hands-on working on the various system displays. The test demonstrates the person's ability to perform the service and maintenance, interpret the manufacturers manuals pertaining to servicing and an understanding of the NFPA requirements on servicing of pre-engineered Commercial Kitchen Fire Suppression Systems. The passing grade is 70%. This seminar is offered just about every other week at various locations throughout the US and Canada (see schedule). Class size is limited. In addition to our one day seminars FPC offers more extensive training on Commercial Kitchen Fire Suppression Systems; call 888-670-2965 or email info@fpcltd.com for more information. Hydrotesting Fire Extinguishers & System Cylinders and DOT HazMat Regulations Hydro testing requirements of low & high pressure extinguishers and system cylinders and hazardous material employee training requirements. DOT General awareness, Function-Specific, Safety Training, Security Awareness and Driver Training. Call 888-670-2965 or email info@fpcltd.com for more information. Seminar on Kitchen Fire Suppression Systems, Fire Extinguishers, Pre-Engineered and Engineered Fire Suppressions Systems for Fire Marshals, Fire Inspectors and Code Enforcement. FPC has provided CEU courses for Fire Marshals, Fire Inspectors and Code enforcement personnel for Texas, Louisiana, Florida, New York, Connecticut, New Mexico, New Jersey and Virginia. 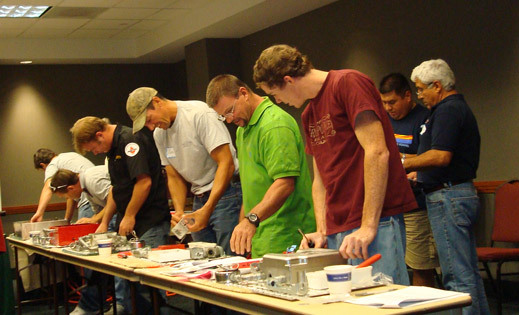 We have had Fire Marshals and Fire Inspectors attend our course from states not requiring CEU's for their own education and training from states such as North Carolina, Georgia, South Carolina, Oklahoma, Maryland, California, Missouri, Kansas, Hawaii, and the District of Columbia. Jurisdictions that accept FPC training to meet their licensing requirements for Fire Protection Companies. In the states that recognize our course as either equivalency to the fire marshals testing, third-party certification training or CEU's (Continued Education Units) are Florida, Louisiana, New Jersey, Tennessee and Iowa. States or jurisdictions within a state that recognize our course for training or certification purposes are North Carolina, California, Michigan, West Virginia, Colorado, North Dakota, South Dakota, New Mexico, Minnesota, and New York. 7.1.2.1* Persons performing maintenance and recharging of extinguishers shall be certified. 7.1.2.1.1 Persons training to become certified shall be permitted to perform maintenance and recharging of extinguishers under the direct supervision and in the immediate presence of a certified person. 7.1.2.1.2* Certification requires that a person pass a test administered by an organization acceptable to the AHJ. 7.1.2.1.3 The test shall at a minimum be based upon knowledge of the chapters and annexes of this standard. 7.1.2.1.4 The testing process shall permit persons to use the standard during the test. 7.1.2.1.5 Persons passing the test required in 7.1.2.1.2 shall be issued a document or a certificate. 7.1.2.1.6 The document or certificate shall be made available when requested by the authority having jurisdiction. 7.1.2.2 Persons performing maintenance and recharging of extinguishers shall be trained and shall have available the appropriate manufacturer’s servicing manual(s), the correct tools, recharge materials, lubricants, and manufacturer’s replacement parts or parts specifically listed for use in the fire extinguisher. 8.1.1 Pressure vessels used as fire extinguishers and specified components of fire extinguishers shall be hydrostatically tested in accordance with this chapter. 8.1.2.1.1 Personnel performing hydrostatic testing shall be certified by an organization with a certification program acceptable to the authority having jurisdiction. 8.1.2.1.2 Hydrostatic testing facilities with a DOT certification [requalification identification number (RIN)] or a TC certification shall be permitted to perform the task of hydrostatic testing without having additional certification as a fire extinguisher technician as outlined in 7.1.2. 8.1.2.1.3* Where hydrostatic testing is subcontracted to a facility described in 8.1.2.1.1, an extinguisher technician complying with 7.1.2 shall perform assembly and disassembly of valves and cylinders, replacement of any parts or components, and all other extinguisher service work.